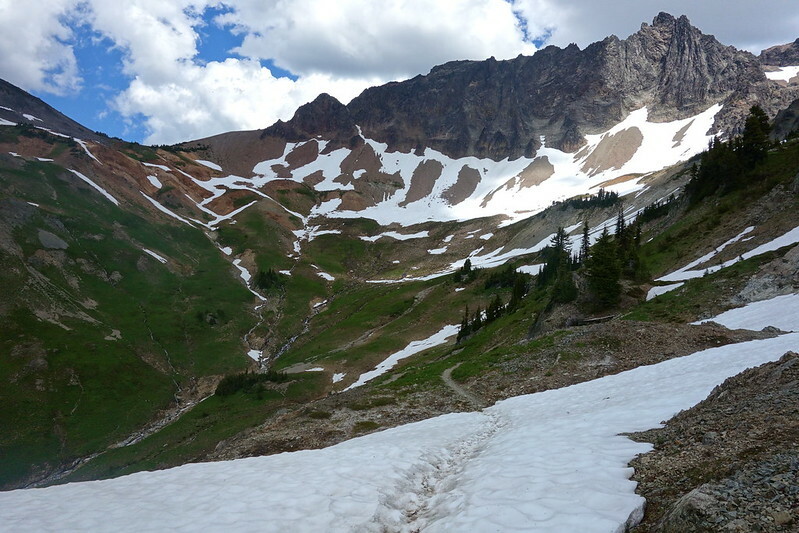 WA PCT, Introduction: Routes and Resupplies – Hi, Alpine. I spent a good portion of the summer section-hiking the PCT through (thru?) Washington, from Panther Creek Campground, a bit north of Bridge of the Gods, to the North Cascades Highway. With side trips and wandering, the whole thing came out to just shy of 500 miles, and took 26 days. It’s taken me a while to start writing about it here because life kept getting in the way, and I guess also because it’s still a lot to digest. It’s been months, but the whole thing just recently started making sense to me. The next few dozen posts will be daily journals from the trip. But before that, I want to say a few things about the trip as a whole—the sections, resupplies, highs and lows—if for no other reason than to give some advice to my past self. It’s traditional to break the trail into sections: in Washington, H through L (though I only made it K). The best maps, by far, are available for free from Halfmile (here), and can be printed for a nominal fee by the fine people at Yogi’s Books (here). Halfmile’s maps have the incomparable virtue of dividing the entire trail into miles, such that, for example, one can say “Mile 2241.8,” and everyone knows they’re talking about a beautiful little campsite along Killen Creek, in the shadow of Mt. Adams. The section divisions are largely symbolic, falling at freeways or major road crossings rather than at geographic boundaries. But each section still seemed to have its own personality. I suspect this was as much a matter of my changing moods as the trail’s, but ah well. Section H is the longest section in Washington, and the most varied. The first fifty or so miles pass through nondescript second and third growth forest, through clear cuts and along old roads. But then there’s a series of successively more serene wildernesses: Indian Heaven, full of craggy peaks, subalpine ponds, and pesky mosquitoes; Mt. Adams, where the trail cuts a nearly flat path along the west side, past enumerable lava flows, snowmelt streams, flowered meadows, and endless views; and finally, Goat Rocks, which is rightly regarded as perhaps the prettiest section of trail in Washington, full of snowy basins, bright meadows, and rocky ridges stretching to infinity. Section I has a split personality. 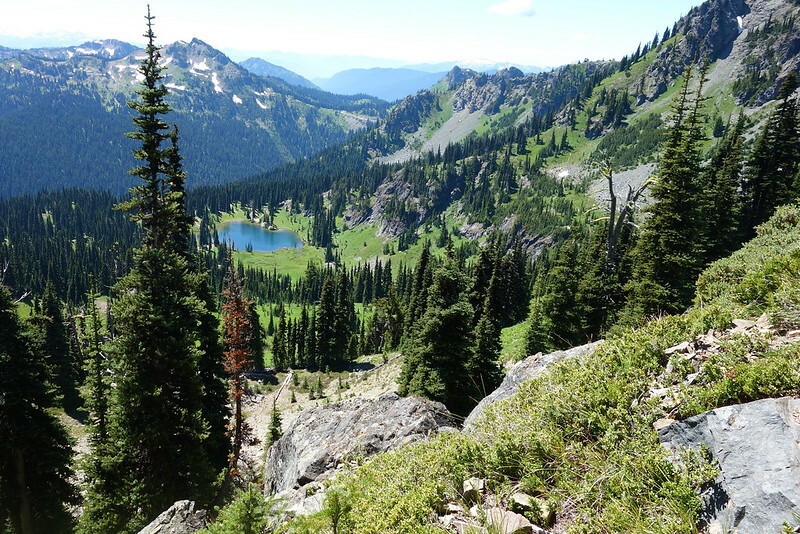 For the first fifty miles, it passes through wonderfully varied wilderness: subalpine lakes through the William O. Douglas Wilderness; steep, rocky ridges on the eastern tip of Mt. Rainier National Park and southern half of the Norse Peak Wilderness; and deep, old forest as it descends through the northern half of Norse Peak. But then, between the Norse Peak Wilderness boundary and Snoqualmie Pass, it enters a checkerboard of public and private land, all touched by a long history of logging: clear cut scars to the horizon; charred trees from a fire started by loggers; dozens of hastily built roads; and water made scarce by impoverished soil. I’m not categorically against logging, but walking through the second half, through the sorts of scars that often remain hidden from main roads and routes, I couldn’t help but think that there must be a better way. Section J is just magnificent. 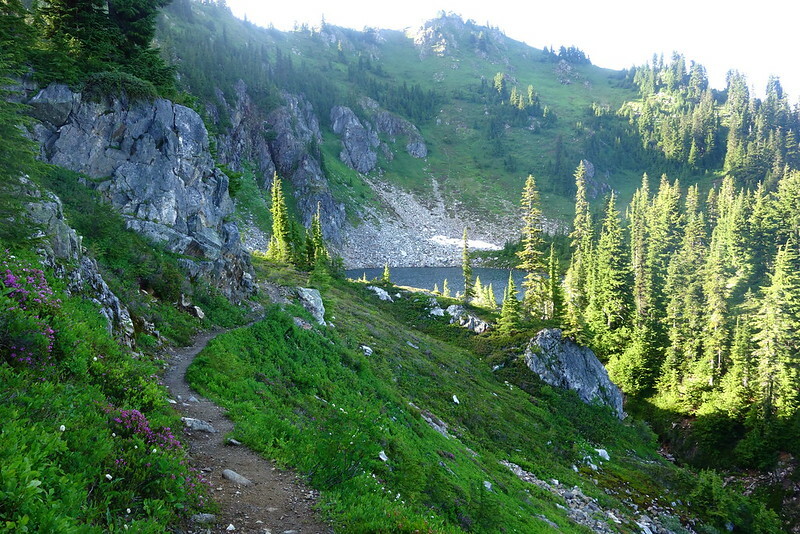 It spends nearly its entire 70 miles in the Alpine Lakes Wilderness, traversing endless ridges, meeting deep blue pools and rushing rivers, and just generally being more consistently pleasant than I thought a trail of this length capable of being. Even in foul weather—I walked out in a storm—there are still the nearby pleasures of deep woods and complex granite walls. Most full thru-hikers do the whole thing in two or three nights. I took four, including a couple half days, but could easily have stayed for twice that, exploring the many, many possible side trips. If one were looking for an easily manageable section to hike, this would be a very good place to start. Before starting this section, northern Washington had always been sort of mythic to me: I’d driven through the North Cascades, and maybe been to Lake Chelan when I was a kid, but never spent any concerted time up there beside that. Holy hell! It’s… it’s just difficult to describe. I don’t think I’ve seen anything like it, save perhaps the Sierras, but even there, it’s often just granite. (Okay, “just,” but you know what I mean.) In northern Washington, it’s granite and glaciers and deep deep river valleys and sun and storms always ready to cross some distant pass and take over the skies. It’s wild in a way different, and deeper, than any other place I’ve ever been. It’s also, unless you’re thru-hiking, kind of a pain to get to. 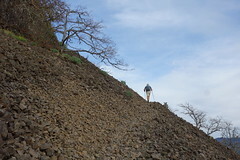 Some of these areas are twenty or thirty miles from the nearest trailhead. It made passing through sort of tragic–when am I ever going to get here again?–but it also meant that I spent most days and nights alone, surrounded by mountains and glaciers and trees and sky. In a hike this long, you’re going to need to occasionally resupply your food. 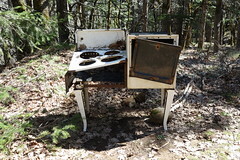 Philosophically, I like the idea of buying as you go, but that’s difficult in Washington, because the trail generally only crosses at small settlements with gas stations or small inns, but no grocery stores. So I ended up sending myself food at four points along the way. In every case, it’s a good idea to write your expected time of arrival on your packages, because these places receive a lot of hiker mail. 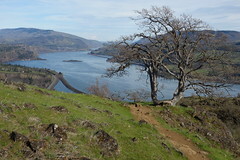 I didn’t end up having to send to Kracker Barrel, because Krista came and met me with a package, but the place was lovely all the same, and I saw many other hikers picking up resupplies with no problem. If you’d like to buy your stuff, the town of Packwood is 20.5 miles west of White Pass on Highway 12, and has a store, coffee shop, and basically anything else you could want. The Chevron Station’s a little bizarre—when I was there, they were storing everyone’s packages in a disused cooler in back, and there was a tourist there taking pictures—but it gets the job done. And, again: go to the food cart. It’s amazing. They apparently also occasionally have food, coffee, and even a rudimentary store, but… don’t count on it. 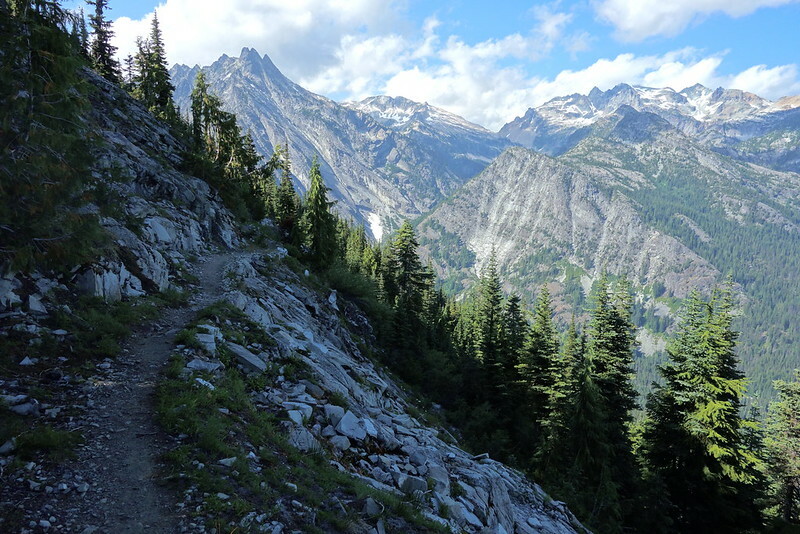 I spent the night in Stehekin, and you should too: there are a bunch of free (FREE!) campgrounds scattered around town, as well as a reasonably priced, and unreasonably charming, inn. There’s only one restaurant, which is distinctly workmanlike, but after the previous section, you’ll be happy for it. And there’s a bakery, which… I don’t think I have words for how heavenly the bakery is. I spent at least twenty dollars there, for well over 10,000 calories, and still left worrying I’d missed out. From Stehekin, it’s only 80.7 miles to the Canadian border, which is eminently doable without a resupply. But that said, if you like, you can easily resupply from the North Cascades Highway (Highway 20, Mile 2588.9, just 19.5 miles past Stehekin). You’ll have to hitchhike, but there are two very charming towns not too far east: Mazama, 22.4 miles away, and Winthrop, 35.8 miles away). Of the two, I’d probably go for Winthrop, which is a strong contender for Most Charming City in America.